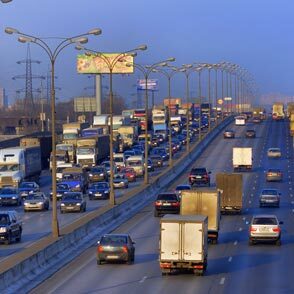 Michigan Traffic Violations FAQ | Traffic Laws | Murray A. Duncan, Jr.
Disclaimer - This Frequently Asked Questions page is provided solely as a means of providing basic answers to questions about the Michigan Vehicle Code and is not designed or intended to provide a basis to contest a citation for a violation of the code. The positions stated are only those of the Michigan Department of State Police and are not binding on any other law enforcement agency or any court. 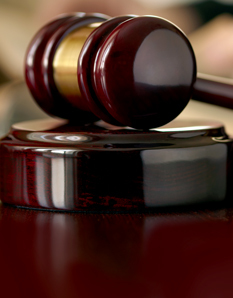 If our position is supported by case law then it will be enumerated within the answer provided. The information on this page is provided by www.Michigan.gov and the Michigan Department of Transportation. Answer: The Michigan Department of Transportation (MDOT) has recently begun replacing the old flashing red signals for left turn lanes at intersections with a new style of signal that incorporates four lights. This is what MDOT has to say about the new signals. "Those lights are a flashing yellow arrow which permits a left turn when oncoming traffic is clear (oncoming traffic has a green light), a steady green arrow allows you to turn left, a steady yellow arrow warns that the left-turn signal is about to turn red and you should prepare to stop, and a steady red arrow which requires you to stop. The steady red arrow will be followed by a flashing yellow arrow on the next cycle." 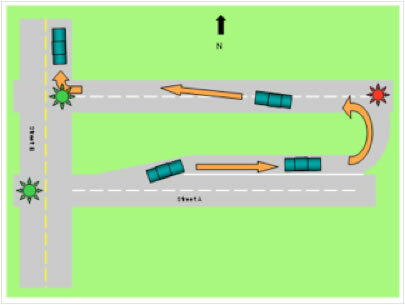 For more information read this brochure on the New Four-Arrow Signal. The Michigan Court of Appeals has finally clarified the language in MCL 257.648 requiring the use of a signal when changing lanes, or "turning from a direct line." Their decision--published, and therefore binding on lower courts — states in summary "...a reasonable person of ordinary intelligence is not required to speculate about the phrase's meaning, and MCL 257.648 provides fair notice of what conduct is proscribed. We hold that MCL 257.648 requires drivers to use a turn signal when changing lanes on a highway and is not unconstitutionally vague." Proper use of a turnaround or "Michigan Left". Improper left turn on red. Within the boundaries of any city, village, or township, that has adopted the Uniform Traffic Code, rule 434 states... "R 28.1434 Rule 434. Limitations on turning around; violation as civil infraction. The driver of any vehicle shall not turn the vehicle so as to proceed in the opposite direction on any street in a business district and shall not, on any other street, so turn a vehicle unless the movement can be made in safety and without interfering with other traffic. A person who violates this rule is responsible for a civil infraction." Under the UTC the requirement of whether or not there must be a sign posted prohibiting u-turns is debatable. Some say yes and some say no. The final determination will be up to the individual court. Answer: Here is what MCL 257.634 has to say about lane driving. If the road has 2 or more lanes in one direction, vehicles shall be driven in the extreme right-hand lane. 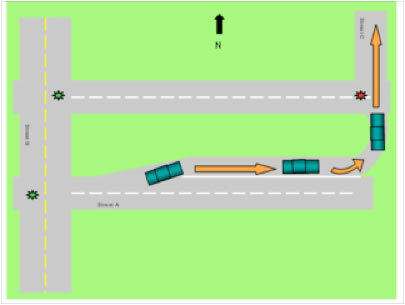 If all lanes are occupied by vehicles moving in substantially continuous lanes of traffic then a driver can use any lane available. A driver may also use the left lane for a reasonable distance when preparing for a left turn. On a freeway having 3 or more lanes, a driver may use any lane lawfully available. MCL 257.642 gives further direction and states in part, "…Upon a roadway with 4 or more lanes which provides for 2-way movement of traffic, a vehicle shall be driven within the extreme right-hand lane except when overtaking and passing, but shall not cross the center line of the roadway except where making a left turn. Answer: The law that covers window applications is MCL 257.709. The use of tinting is limited to the rear side windows, the rear window if the vehicle has outside mirrors on both sides, and the top 4 inches of the front side windows. There is a limited exception for medical necessity with a doctor's prescription, which allows for tinting to be applied to the front side windows as well. Michigan does not have a specification for the darkness of the window application, but does prohibit applications with a solar reflectivity greater than 35%. Answer: MCL 257.709(3)(e) allows for front side window tinting with "...a letter signed by a physician or optometrist, indicating that the special window treatment or application is a medical necessity. However, the special window treatment or application shall not interfere with or obstruct the driver's clear vision of the highway or an intersecting highway." A vehicle equipped with such tinting could not legally be driven by a person other than the person to whom the letter was given. Question: I own a retired Police Cruiser and am looking into adding on some extra equipment (Spotlights, etc.). Before I do so I would like to know what is legal (both on and off the road) here in Michigan. Answer: If your intention is to equip this vehicle to represent an authorized emergency vehicle you cannot operate that vehicle on the roadway unless you are a peace officer. The use and/or possession of a flashing, rotating, or oscillating light of any color would be prohibited. Should you decide to operate a vehicle on the roadway equipped as a police vehicle you would be subject to arrest for the criminal act of "False Representation as a Peace Officer". Question: Would it be legal to install a (police type) siren on my car for purposes of an auto alarm? Some ORV's (generally dune buggy type) may be registered with the Secretary of State and operated legally on the road. The major determining factor is how the vehicle is equipment. If your vehicle possesses the required equipment, you can contact a Secretary of State branch office to obtain a form for an inspection in order to register the vehicle. If your vehicle does not meet these equipment standards, it cannot be registered, nor can it be operated on any road or right-of-way in Michigan, subject to some very specific exceptions. Answer: In practical terms, no. MCL 257.710 allows for the use of studded tires if they meet the specifications listed in subparts (c), (d), and (e). The part that specifically deals with studded tires is subpart (d) which states; "The department of state highways and transportation shall promulgate rules establishing acceptable standards to permit the use of a tire with studs or other traction devices to be used on a street or highway after April 1, 1975. The rules shall make separate provision for the extreme winter snow and ice conditions of the Upper Peninsula and the Northern Lower Peninsula. The rules shall include a restriction on the amount and dimension of protrusions that may be allowed on a tire, the type of material that may be used in a stud, traction device, or tire, and the amount of road wear that a tire with studs or other traction devices may cause on a street or highway." Administrative Rules 247.171 through 247.175 govern studded tires and set the criteria for their use. These rules state two conditions that must be met for the use of studded tires.Note: to date no manufacturer of tire studs has supplied information to the Michigan Department of Transportation that their product meets or exceeds the required pavement wear specifications. First, they can only be used between November 15 and April 1 of the succeeding year except in the Upper Peninsula and the Northern Lower Peninsula, where, because of extreme winter snow and ice conditions, they may be used between October 1 and May 1of the succeeding year. Northern Lower Peninsula is defined as those counties whose southern boundaries are as far or farther north than the southern boundary of Missaukee county. Answer: RADAR jammers, both active and passive, are illegal under federal law in all 50 states (see excerpt from FCC news release). FCC FINDS MARKETING OF ROCKY MOUNTAIN RADAR'S SPIRIT II RADAR JAMMER TO BE IN VIOLATION OF ITS RULES. Ruled that a radar jamming device manufactured by Rocky Mountain Radar that interferes with police radar signals is illegal; found that interference from these devices creates a threat to public safety. Report No: CI 97-14. by MO&O. Action by: Commission. Adopted: December 4, 1997. (FCC No. 97-404) News Media Contact: David Fiske (202) 418-0500. CIB Contact: Ana J. Curtis at (202) 418-1160. Question: Is the use of a radar detector in a private vehicle legal in the State of Michigan? Question: I was told that you could dial *677 from your cell phone and it would connect you directly to the state police. Is this true? Answer: This internet myth is actually based partially in reality, but does not apply to Michigan. In Michigan, as well as most states, the number to contact for an emergency is 911. Some states have a non-emergency number as well, with *677 being the variant that works in Ontario (677=OPP on the telephone keypad). Question: Is it against the law to talk on a cell phone while driving in Michigan? Answer: Michigan does not have a law specifically prohibiting cell phone use in a vehicle. A driver who becomes distracted by using a cell phone, and commits a traffic violation could be charged with careless driving, or with the specific violation, such as improper lane use, if they are drifting in and out of their lane. Some municipalities have recently enacted local ordinances that prohibit using a cellular phone while driving within their respective jurisdiction. Any municipality that establishes such an ordinance should post notification at their jurisdictional boundaries to alert motorists. Question: I was told recently that if you are from out of state and you are pulled over for speeding in Michigan, you must either pay $100 cash immediately or give up your driver's license. Is this correct? Answer: MCL 257.749(1) states in part "When a person who is not a resident of this state is stopped for a civil infraction...the police officer making the stop shall take that person's driver's license as security for the nonresident's appearance in court and satisfaction of any order which may be issued under section 907 and shall issue to that person a citation as provided in sections 727c and 742. MCL 257.749(2) states "In lieu of the officer's taking of the license under subsection (1) or before appearance in court, the person stopped may recognize to the officer or to the court for his or her appearance by leaving with the officer or court a guaranteed appearance certificate or a sum of money not to exceed $100.00." Question: Please provide me with the state law, act or policy that outlines the speed limits on unmarked rural roads. It is our understanding that the speed limit on an unmarked rural dirt road is 45 mph and 55 mph on an unmarked rural paved road. Question: I live on a road where many new homes are being built. The speed limit is 55 mph and I think that is too high. Can you tell me how speed limits are established? Question: Under what conditions may a police officer exceed the posted speed limit? Question: I would like to request a list of helmets that have been approved by the Department of State Police. Question: Is there a specific age, or weight that children can legally ride as a passenger on a motorcycle? Question: I heard that Michigan changed its seat belt law and now requires booster seats. Is that true? Answer: Michigan recently amended its safety belt law which becomes effective July 1, 2008. A synopsis of the amended law follows. Children up to the age of 4 must be properly restrained in a child safety seat no matter where they are seated in the vehicle. There are a few exemptions to both of these laws, but we always encourage people to properly fasten their safety belt at all times while traveling in a vehicle. Answer: Michigan's child restraint law states that every child under the age of 4 years must be properly restrained in a child restraint seat no matter where they are seated in the vehicle. The law does not cover where the children should ride but, regardless of what the law states, we know that there are safer ways to transport children in a motor vehicle. Statistics consistently show that the rear seat is the safest place for all children 12 and under. Federal standards require child seat manufacturers or automotive manufacturers in the case of built-in child seats, to provide instructions and label these seats with warnings for incorrect placement. To comply with state law you MUST follow the manufacturer's instructions. Answer: Michigan's child restraint law does not prohibit children of any age riding in the front with an air bag; however, research has proven that any small person (even an adult) can be seriously injured or even killed by the force of an air bag. Answer: Michigan Law does not prohibit this type of action; however, in accordance with MCL 257.710e, children under the age of 16 would be prohibited from doing so if there were passenger seats available in the pickup or vehicle towing the camper. The Michigan State Police does not endorse this type of action because a camper, whether it is the type secured in a pickup bed or a trailer type is not designed and manufactured for such use. The operator and/or registered owner could be held liable both criminally or civilly if a passenger is injured or killed while riding in the camper. Question: My husband saw on the news last night that golf carts were allowed on the county roads in the state of Michigan. Is this true? What are the requirements? Answer: In late 2006, the Michigan Legislature amended MCL 257.25b and modified the definition of a low speed vehicle to conform to federal standards. As now defined, a low speed vehicle means a four-wheeled motor vehicle whose speed attainable in 1 mile is more than 20 mph but not more than 25 mph on a paved level surface. A low speed vehicle must be equipped as necessary under both federal standards and Michigan Law. The operator must have a driver license and the vehicle must be registered and insured. If the cart is not equipped as necessary it can only be legally operated on a highway, (including the right-of-way) in the state of Michigan, under very strict circumstances. In those situations it would be defined as an ORV found in MCL 324.81101 and circumstances allowing operation on a highway while severely limited can be found in the Natural Resources and Environmental Protection Act, MCL 324.81122. Local municipalities can authorize situations where an ORV can be operated on a highway within their jurisdiction. MCL 324.81131 defines those situations. Answer: A number of questions have been received concerning use of motor vehicles on public roads that were originally designed and manufactured as off-road vehicles. As a result, we published Traffic Services Section Field Update #21 that discusses this question in depth. Readers must be aware that if they retro-fit an ORV and make false statements, or provide false information to law enforcement or the Michigan Department of State when having the vehicle inspected, and as a result improperly register the vehicle, they can be charged with a violation. Question: Where can I legally ride a moped? Answer: A goped, while not specifically defined in the Michigan Vehicle Code, does fall under the definition of a moped MCL.257.32b. Mopeds are required to have certain equipment such as; a headlight, brake light, seat, horn, muffler, and brakes on each wheel, in order to be legally operated on the roadway. In addition, the operator of a moped must be at least 15 years of age, have a moped license or an operator/chauffeur license, and the vehicle must be registered with the Department of State and display a valid registration plate. Finally, a person operating a moped must wear an approved crash helmet if they are under 19 years of age. Answer: Interested parties such as individuals involved in the crash and/or their attorney, and insurance companies should contact the Traffic Crash Purchasing System(TCPS) via the internet at the aforementioned link. If unable to do so you can contact the Michigan State Police Post that responded to the crash. Each post retains traffic crash reports for the current year plus two years. If the crash occurred prior to that you must request a copy of the report from the Criminal Justice Information Center using a Freedom of Information Request form. In addition, if you are not an interested party as described above, you must complete a Freedom of Information Request to obtain a specific traffic crash report. Complete the form with as much information as possible and mail to the address listed on the form. If another agency other than the Michigan State Police responded and completed a crash report you will need to contact that agency directly or utilize the TCPS. For any other traffic law information or auto accident-related information, please contact traffic and dui attorney, Murray A. Duncan Jr., or call us at 616.451.8596.